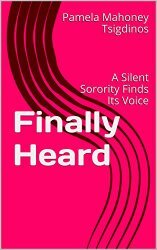 Finally Heard: A Silent Sorority Finds Its Voice is a short ebook designed in the Kindle Singles model. It incorporates wisdom from ‘Generation IVF’ designed to spark discussion about infertility and the little discussed aftermath of fertility treatments. Finally Heard moves beyond the personal to examine the complex inter-relationship of the psychological, social and cultural implications of ‘Generation IVF.’ Today’s cultural preoccupation with parenting and the growing commercial focus of the for-profit fertility industry has birthed a fear-driven patient/consumer population and society ill-equipped to process reproductive failure. Finally Heard makes clear that the disproportionate emphasis on ‘magical thinking’ and the new industry focus on ‘social egg freezing’ has bred an expectation of parenthood that is creating new challenges for young women as well as parents of children who may one day counsel children on decisions around reproductive health.